The Storefront Library is a unique opportunity to model and test how the physical elements of a branch library can be designed to best serve aspects of a library program. Students and architects from Harvard’s Graduate School of Design (GSD) have begun work on creating concepts for a unique, visually and tactilely engaging space which anticipates and responds to the needs of Chinatown residents. To reduce the need for furniture, the design will incorporate work spaces and surfaces, reading areas, newspaper storage racks, and possibly even lighting, into modular, reconfigurable, elements that can potentially be disassembled, reassembled and reused in another space. Elements will be designed to have minimum impact on the commercial space into which they will be installed. 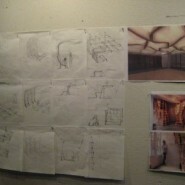 For a closer look at the design process, visit the students’ blog.